What is it & how is it different? 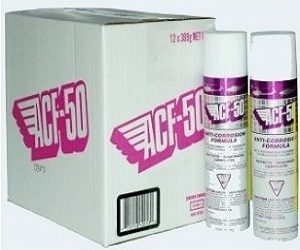 ACF-50 (Anti-Corrosion Formula) is a product originally designed for aerospace applications that is now available to motorcyclists. Its aviation approval is MIL-SPEC 81309 Type II and III, which means it is approved for ferrous and non-ferrous metals, electrical systems and electronic components. It is a very sophisticated type of ‘thin film’ water displacement product designed as a corrosion prevention and inhibiting compound for the harsh environmental conditions associated with aircraft operation, with the added advantage that it will stop existing corrosion and is slow to deteriorate (it has a 12 to 18 month active life). It is also a very efficient penetrant without loosening structural attachments (a bit disastrous on an aircraft or motorcycle) and an excellent lubricant without having any high-pressure lubricants, wax, silicon or Teflon additives (which actually seal in moisture thereby aggravating and perpetuating the corrosion process). It is ‘pro-active’, neither passive nor waxy, is compatible with plastics and paint and is extremely economical in use and contains no water. How does this relate to other multi-use sprays? 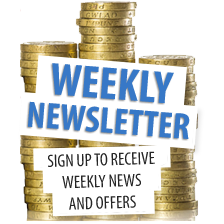 You need to consider what you are planning to use it for. As a lubricant or penetrant? Yes, ACF-50 can do those jobs, but potentially you may find other sprays to be more cost effective for that application. Where ACF-50 comes into it’s own is for it’s protective qualities. Once applied, ACF-50 will dry out, leaving a protective coating that lasts up to 12 months. That’s a full year of protection from one application. ACF-50 is also waterproof, a massive benefit over other multi-use sprays, where repeated application is necessary to ensure ongoing protection. So it may cost a bit more than many other sprays, but you get more protection for your money. One major criticism of other protective sprays is that certain additives can actually seal in moisture. 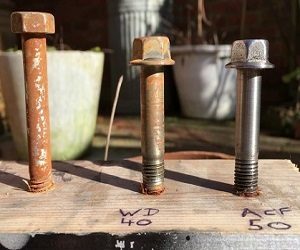 This can promote and accelerate the effects of corrosion, rather than prevent it! ACF-50 has a unique composition that creeps under water droplets and actively pushes moisture away. This allows the protective element of the product to seal against the metal, thus providing an effective barrier to future corrosion. How do I use it on my bike? 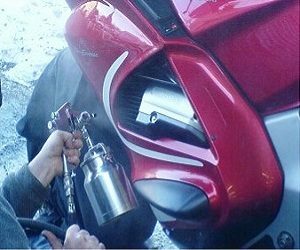 Its uses on motorcycles are very similar to those on aircraft. Sprayed onto the structure, joints and welds i.e. under the tank and seat, frame and steering head area (where the corrosion works away unnoticed), under panels and on hidden parts of the engine, radiators, engine cases, forks, calipers, wheels, anywhere on the bike really because it will work hard to prevent corrosion and structural degeneration. Where corrosion is already evident it will help inhibit further progress by insulating and electrically ‘switching off’ the corrosion cell. It will also penetrate around bolts, screws and hardware protecting them and preventing seizure. Exposed engine and gearbox cases, swinging arms, forks and other exposed parts will benefit from ACF-50’s thin film technology by not corroding, will stay looking good and will clean up easily after a salt laden ride. It is also excellent on black plastic trim without leaving the residue of silicon. It will protect electrical joints, plugs and components and prevent corrosion causing high resistance joints. This goes for electronics as well, such as computerised ignition and fuel control units and their multi pin plugs, while switches, controls and levers will all be lubricated as well as protected from corrosion. Multi-pin plugs and connectors benefit from having ACF-50 applied directly to the contacts. 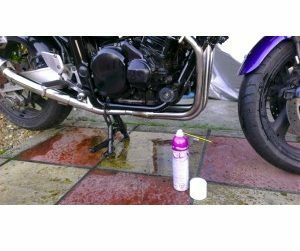 It will, with regular applications; make maintenance easier and save you money, make the bike easier to clean, look better, help prevent surface/structural/electrical corrosion related failure thereby increasing reliability and it will increase the bike’s value. That’s what it will actually do! Being designed for aircraft it contains no aerosol, instead it has a non-flammable propellant so when cold it sprays like shaving foam. Give the area the lightest coating/spray you can, enough so that when it creeps it will cover all. It really does creep, so caution with calipers or it will creep on to the pads! Also use a rag and spread it over the areas sprayed. The rag gets impregnated and then spreads it further. Under the tank and hidden areas it will last up to a year. Exposed areas such as forks, the front of the engine, wheels and calipers; just re-treat as necessary. You can tell if it is still active because any water will ‘bead’ on contact. ACF-50 over spray will not harm any rubber components but saturation of “natural rubber” (e.g. harness gaiters of classic cars or motorcycles – 40+ years) should be avoided, as this may cause the rubber to elongate or swell.